Auryn Resources Inc. (TSX: AUG, NYSE American: AUG) (“Auryn” or the “Company” – https://www.youtube.com/watch?v=hKoS2L6g9RA&t=22s&index=3&list=PLBpDlKjdv3yoWEe8WGEU2dq8ikvb5EJ4l ) is pleased to announce that high-resolution till sampling has become an integral layer of data for six targets. 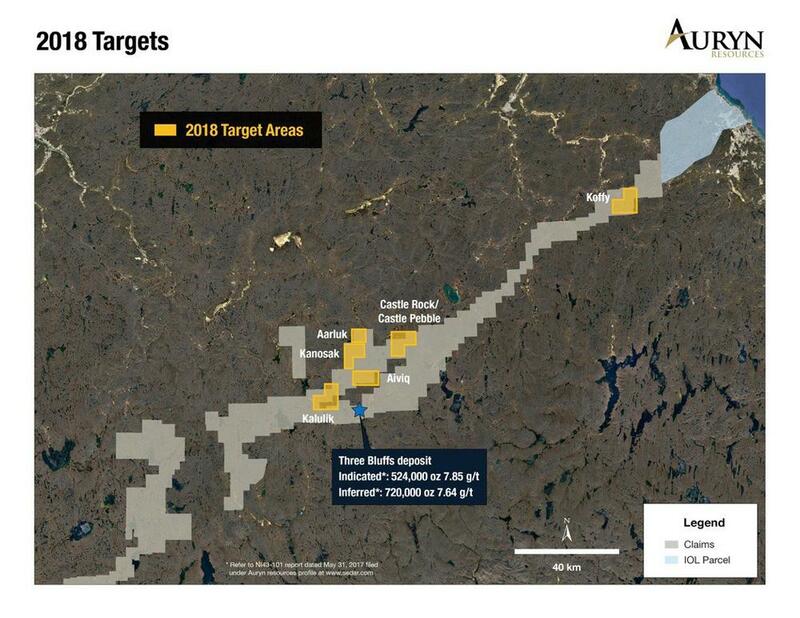 These targets include the already disclosed Aiviq sampling, which was drilled in 2017. The gold assay results from the high-resolution (100 meter by 100 meter spacing) till surveys across nine regional targets (Figure 1) demonstrate greater precision for identifying the potential source areas of high-grade gold mineralization seen throughout the belt. The results of the surveys have delineated gold-in-till anomalies that are consistent with the size of potential deposit footprints and will form the basis of future drill campaigns at Committee Bay. Originally, the high-resolution tills were collected during the 2017 summer exploration program to be analyzed using portable X-Ray fluorescence technology. After receiving the results from the Aiviq discovery drill hole (12.2 meters at 4.7g/t Au), Auryn sent the high-resolution tills to ALS laboratories for ICP to analyze for gold. The gold results demonstrated that the high-grade discovery drill hole spatially overlapped with the gold results from the high-resolution tills. In addition, these results also redefined targets that had not been adequately drilled in 2017 (Figure 2). Five of the nine regional targets have returned discrete new gold targets from the high-resolution tills. These include the Koffy, Kalulik, Aarluk, Kanosak, and Castle Rock target areas (Figures 3 – 7). This release includes certain statements that may be deemed “forward-looking statements”. Forward-looking information is information that includes implied future performance and/or forecast information including information relating to, or associated with the acquisition and title to mineral concessions. These statements involve known and unknown risks, uncertainties and other factors which may cause actual results, performance or achievements of the Company to be materially different (either positively or negatively) from any future results, performance or achievements expressed or implied by such forward-looking statements. Readers should refer to the risks discussed in the Company’s Annual Information Form and MD&A for the year ended December 31, 2016 and subsequent continuous disclosure filings with the Canadian Securities Administrators available at www.sedar.com and the Company’s registration statement on Form 40-F filed with the United States Securities and Exchange Commission and available at www.sec.gov. 2017 pXRF tills Au assay – Samples (250g) of unweathered till were collected from 20-30cm depth in frost boils at 100m sample spacing. Pebbles (>1cm) were removed in the field. Samples were not collected in areas of glaciofluvial or fluvial reworking. Collected samples were sent to ALS Laboratories in Vancouver BC for preparation and analysis. All samples are screened using 600µm screen and analyzed using 50g nominal weight trace level Au by aqua regia extraction and ICP-MS finish method (Au-TL44) on a -600µm fraction. QA/QC programs using internal standard samples, field and lab duplicates, re-assays, and blanks indicate good overall accuracy and precision.